Ruthiebear (Titusville, NJ, United States) on 4 March 2019 in Animal & Insect. Bravo pour cette observation, il se fond dans son environnement. Sad and beautiful image ! Black eyed junco, looks like to me. 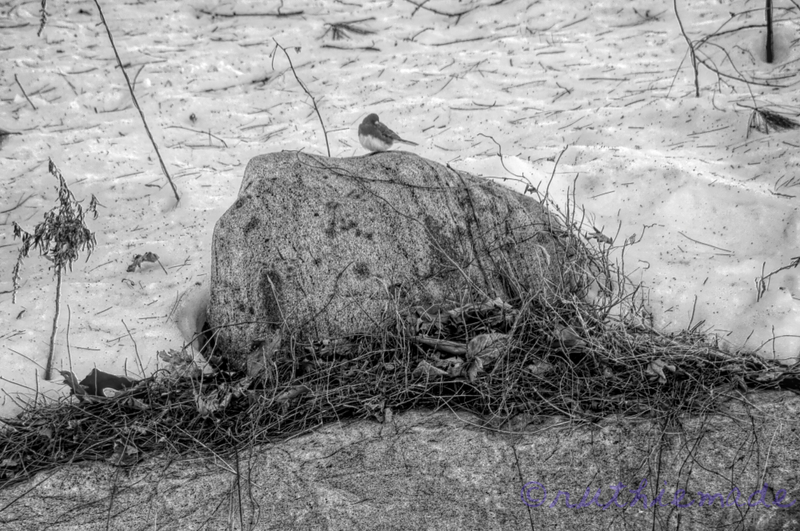 I love these little birds which we see only in the winter around here. Nice shot. Looks like the little bird is sleeping. Nice image Ruthie. Tout gonflé par le froid ... Joli. A very nice image in fine monochrome. A fine capture. The bird must like this big rock. Sweet shot. I bet you and the bird are both ready for Spring. Joli plan nature le noir et blanc est parfait. He is lonely on the rocks. He waited for good weather. Beautiful tones captured in this B&W composition! Great textures as well. @Jeff & Pat: I have missed you two! A cold little bird I would guess. He must be looking for some seeds. He looks so small compared to the big rock! A cold winter scene. Cute bird all puffed up. Il a l'air frigorifié le pauvre, vivement les beaux jours. Lovely shot, Ruthie! We have three or four Junko species every winter here in Flagstaff! I love them - they'll give a lift to even the coldest day!